Whitening can transform the dullest teeth into a dazzling smile fit for a Hollywood star. But before you undergo a whitening procedure, you might have a few questions about it. Here are the answers to a few of the most common. How white can I go? In an office application we can adjust the solution and application time to control the level of shade (dark or light) from subtle to dazzlingly bright. The real question, though, is how much color change will look best for you? A good rule of thumb is to match the shade in the whites of your eyes. Whitening will improve poor dental conditions…right? Not necessarily. Besides foods, beverages or poor hygiene, decay, abscesses or problems from root canal treatments can also cause discoloration. In some dental situations, whitening could make your smile less attractive. If, for example, you have exposed roots due to gum recession, those areas won't bleach like the enamel and could make their exposure stand out more. Better to try and repair these problems before whitening. What effect will teeth whitening have on my dental work? None â? ?composite or ceramic materials won't lighten. The real concern is with creating a situation where whitened natural teeth don't match the color of dental work. Depending on the location of your veneers, crowns or other bridgework you could have a color mismatch that will look unattractive. We would therefore need to take your dental work into consideration and adjust the shading accordingly. Will teeth whitening work on any stained teeth? That depends on the cause of the staining. If it's on the enamel, then external bleaching techniques should work. 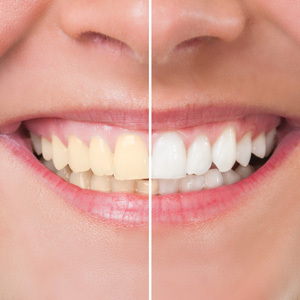 If, however, the discoloration comes from inside the tooth, then only a dental procedure that applies a bleaching agent inside the tooth can alleviate that kind of discoloration. So after whitening, I'm good to go? Well, not permanently. Eventually the brightness will diminish or fade, usually in six months to two years. You can, of course, prolong the fade rate by not using tobacco, cutting back on staining beverages like red wine, tea and coffee, practicing daily oral hygiene and visiting us for regular office cleanings and other dental work. We can also touch up your existing whitening during your visits.